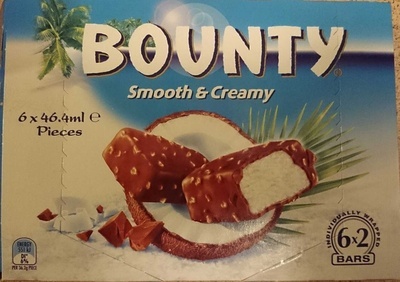 BOUNTY® SMOOTH & CREAMY PRODUCT CONTAINS A CREAMY CENTRE 59%. MILK CHOCE COATING 34%, COCONUT 5% AND COCONUT BISCUIT INCLUSIONS 2%. 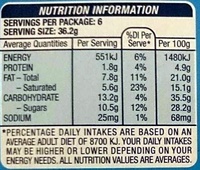 [INGREDIENTS: WATER, SUGAR, MILK SOLIDS, CREAM 9%, GLUCOSE SYRUP (SOURCES INCLUDE WHEAT VEGETABLE OIL, DESICCATED COCONUT COCOA MASS, COCOA BUTTER COCONUT MILK POWDER, COCONUT FLAKES, EMULSIFIERS (SOY LECITHIN, 471), STARCH (SOURCES INCLUDE WHEAT), NATURAL FLAVOURS, FLOUR (SOURCES INCLUDE WHEAT‘) STABILISERS (410, 412, 407), RAISING AGENT (500). 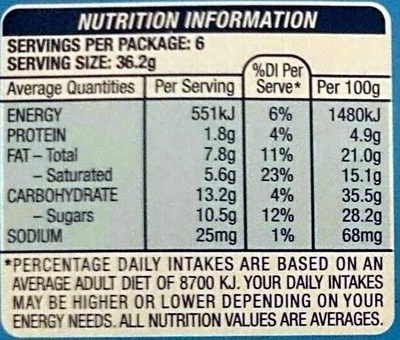 MILK CHOCOLATE CONTAINS A MINIMUM 24% COCOA SOLIDS AND 32% MILK SOLIDS. MAY BE PRESENT: PEANUTS AND TREENUTS. Product added on June 1, 2015 at 12:26:29 PM CEST by foodorigins. Last edit of product page on April 9, 2019 at 4:57:46 PM CEST by moon-rabbit. Product page also edited by harragastudios.